The Maine coast was 90 minutes away from home in Derby, Maine, yet may as well been 500 miles back in the 1950’s. Trips to Down East were rare although I have fond memories of one lobster and clam bake near Bar Harbor with my aunt and uncle. Nothing beats a treat of Maine lobster and clams cooked in seaweed on an open fire right on the beach. Toss in corn on the cob lathered in butter then wrapped in tin foil for a gourmet meal, and all you need are Twinkies for dessert. 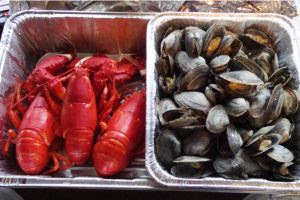 The steamed clams and boiled lobster shown here were eaten more recently. The owner of the lobster pound who sold me those told a comical story of people from away who were obviously unfamiliar with Maine lobster. An older couple tried lobster for the first time and remarked about the incredible flavor to their son who was living in Maine at the time. Yes, they expected bright red fresh Maine lobster!